Tuck in the corner at the junction of Jalan Trus and Jalan Dhoby in old downtown Johor Bahru, Hua Mui coffee shop 华美茶餐室 is just 15 minutes leisurely walk from City Square or 5 minutes if you drive. 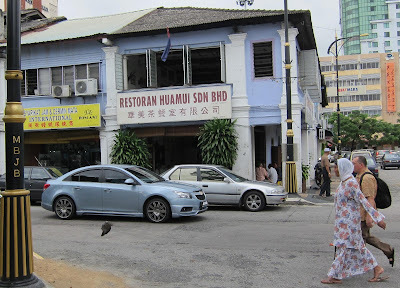 Hua Mui restaurant has become one of my regular coffee stops in JB. 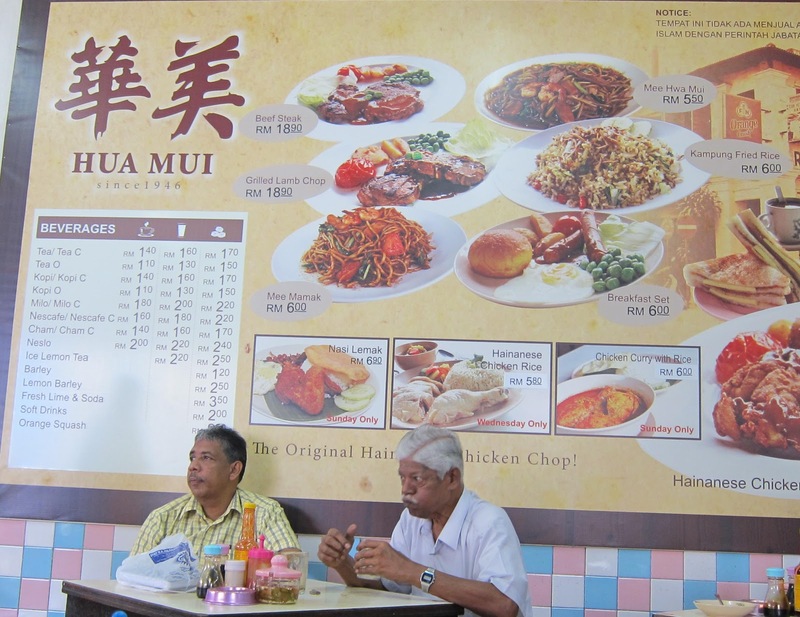 Typical of Hainanese coffee shops, the menu at Hua Mui is an extensive mix of Chinese and Western fare. For breakfast, there are freshly charcoal grilled kaya and butter toast, French toast, American breakfast, and also nasi lemak. 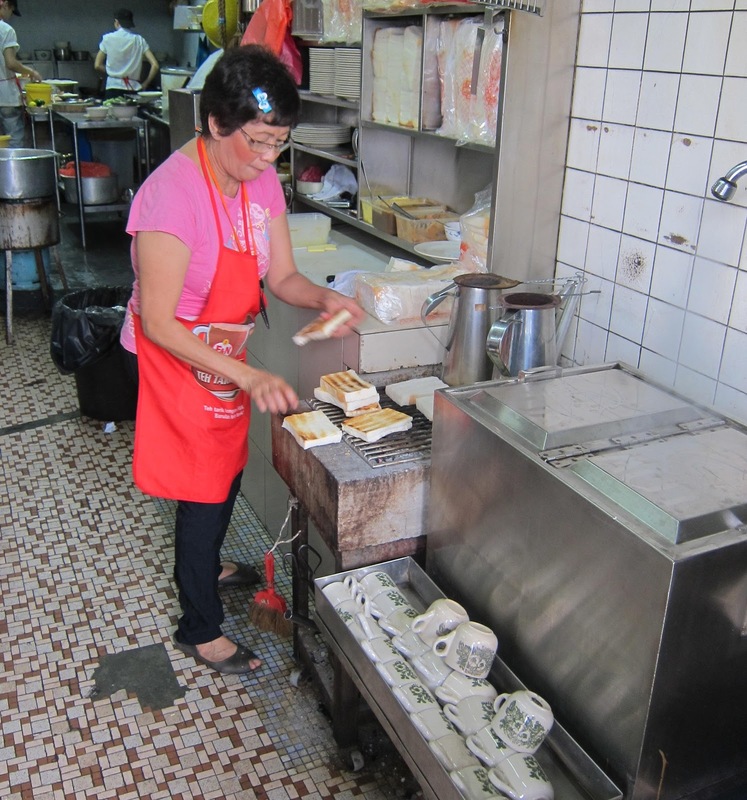 Most of Hua Mui's clientele are regulars, which is not surprising considering that this famous corner coffee shop has been around in this same location since 1946. The atmosphere is warm and cosy. Everyone always looks contented and relaxed here. This popular Hainanese coffee and fried French toast combination which I had on one of my visits costs RM3.40. The Hainanese coffee sweetened with condensed milk is aromatic, strong and full bodied (kau in Hokkien). The star at Hua Mui is their famous signature Hainanese fried chicken chop which I had for a lunch. 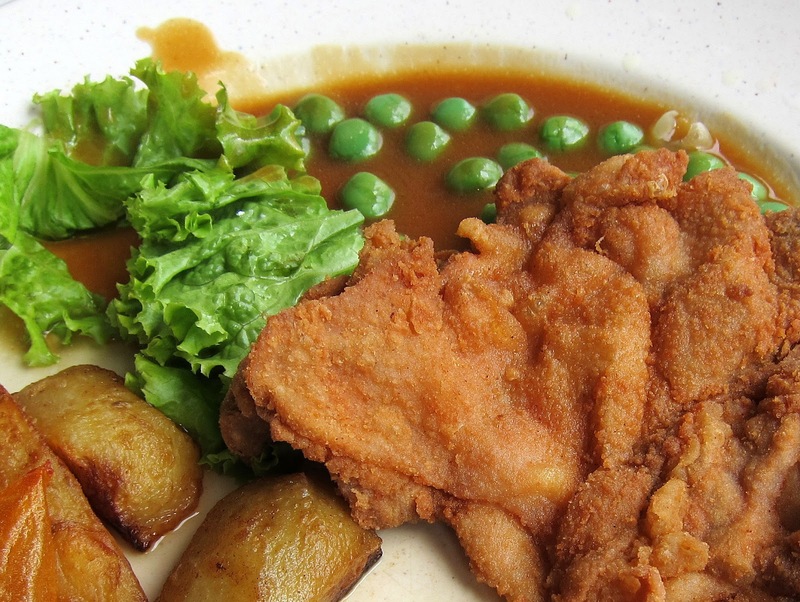 Hua Mui's chicken chop is made from a whole piece of thigh, flattened, coated with a light batter, and then deep fried. The flesh is tender and moist to the bite, and the skin is crispy. The gravy is light and its flavour, delicate. This delicious treat costs RM10.80. The coffee shop has a ground floor and an upper floor. The kitchen is on the ground floor, so the coffee shop has this quaint, clever contraption (known as a dumbwaiter) to lift the food up to the customers on the upper floor. 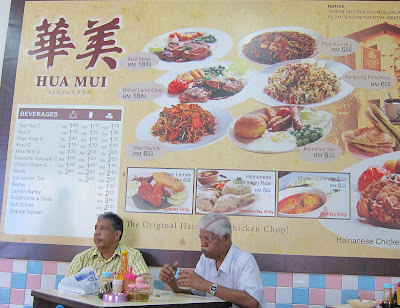 Ms Peggy Loh has written a nice piece on the charms and history of Hua Mui kopitiam. Hua Mui, my favorite kopitiam in this town. Bread toast, the best ! the butter melting, fuh! walah ! My family had been their regular customer since my grandfather. So, now I'm the third generation who still going there. By the way, the have another one branch in Taman Sutera near to SuteraMall. Yes many of our precious memories and our heritage are anchored on our food and eating places. I found chicken chop executed very competently as reported but the gravy is too bland (which you described as delicate). My kakis who came along with me were so disappointed. 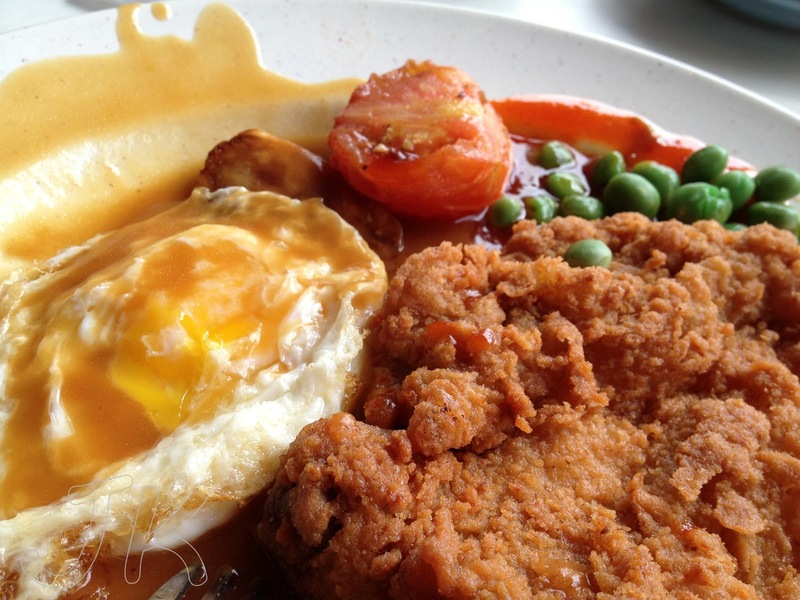 Their reference for good is one at Clementi Central hawker centre, (Tanglin Halt?). They said your tastebuds is more aligned to Malaysian taste than Singaporean. They pointed out that Malaysian Chinese like their Char Kuey Tiow more savoury than sweet compared to Singapore Chinese. Personally, I guess this is true. Was in KL recently and had a much touted Char Kuey Tiow, it was failed to my tastebuds, the sauce not sweet and not enough of the lard flavour. I am sorry that your experience was not a good one. I was in Hua Mui a year ago (when I wrote this post). I need to revisit and see if or how things have changed. You are right that my personal preference is for milder and naturally savoury flavours. Thank you for your feedback. Wish you happy reading and eating. hi thanks for the info regarding this place. I was in Malaysia 2 years ago for the duration of 14 months and was longing for halal chinese food. We had to wait until we got to Kuala Lumpur for Halal Chinese food, but now thanks to you, we have a place to go to in Johor Bahru. Also, for the fact that the place is only a stone throw away from our house in JB. Yay, can't wait. You are most welcome :-D Hope you liked the food here. 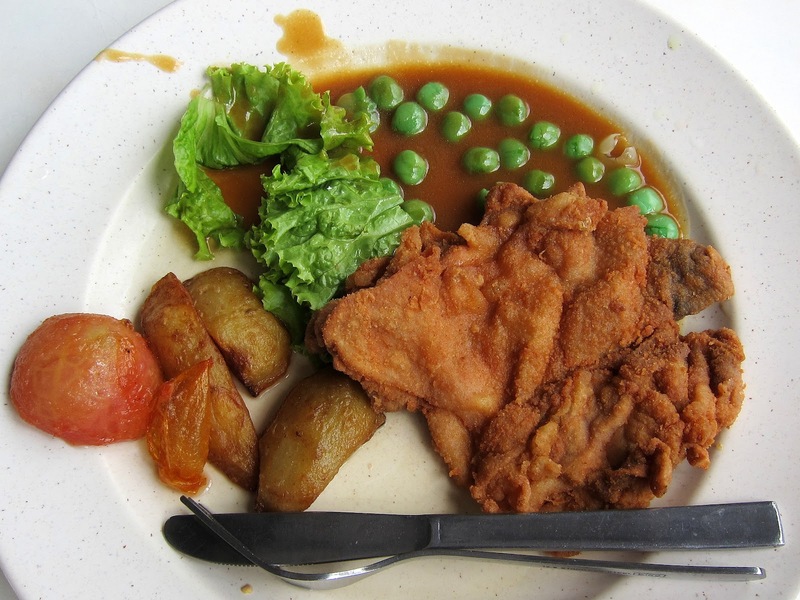 Went there twice 6 months apart and ordered the chicken chop on both occasion, I should say it tasted normal really nothing to shout about, a little salty though just the nostalgic feel that brought back memories for me when I was a kid. But nevertheless appreciate the write up. Looking forward to check out IT Roo one of these days to see the difference. I want to check out their branch near Sutera Mall. I heard very good feedback about that branch. Went to this shop yesterday.quite disappointed..regret to say that their food not much variety as some food only available on certain day..taste of foods are normal..chicken chop over fried and gravy too bland, coffee with ice not 'kau' enuf..curry gravy very oily but the potatoes are soft taste good..fried rice like homecook fried rice..not meant to criticize just want share my feedback om this..